As gas taxes can no longer be depended on to generate consistent revenue, there are concerns about how to finance road maintenance and upgrades at a time when transportation infrastructure needs are growing. To make up for this revenue deficit we must develop a new funding structure that is fair, incorporates new technology, and reinforces broader transportation policy goals. At a minimum, it should include consistent and fair tolling in New York City, then grow to include tolls on all major highways, and ultimately on actual miles driven. For decades, the construction, operation, and maintenance of most of the region’s roadways, as well as some public transportation, has been funded by gas taxes. But gas tax revenues have stagnated as vehicles have become more fuel-efficient, and hybrid and electric vehicles have become more popular. Raising the gas tax rate enough to compensate for the reduced demand for gasoline does not appear to be politically viable. This funding crisis has led to widespread lack of investment and deteriorating conditions on our roadways. Every year, we spend $6 billion in capital improvements to our highways and bridges, yet they remain in such poor condition that the American Society of Civil Engineers has graded them a “D” in our region. In the face of dwindling gas tax revenue and growing transportation infrastructure needs, we must find other ways to generate revenue, and do so in a way that reinforces other policy goals such as managing traffic, reducing driving, and redirecting people to public transportation. Relatively small reductions in vehicle volumes can generate substantial reductions in traffic congestion, as has been demonstrated in cities like London, Stockholm and Singapore, which have successfully implemented congestion pricing. The three revenue-generating strategies described below should build on each other as technology begins to change public acceptance of user fees based on when, where, and how much people drive. Encouraging people to drive miles out of their way to avoid the tolled crossings, causing more traffic in the most dense parts of New York City (so-called “toll shopping”). The Brooklyn-Queens Expressway, along with local streets in Lower Manhattan, Brooklyn, and Queens, are perpetually clogged with trucks and personal vehicles that would otherwise have chosen a more direct route if pricing were comparable. Encouraging commuters to drive instead of taking public transportation, merely to avoid the cost of a subway or bus fare. This is particularly unfair given that those who drive into Manhattan earn, on average, a higher income than those who use transit. Charging higher tolls at other bridges to make up for the lack of revenue. These other bridges typically serve parts of the city where there are fewer transit options, whereas those served by the free bridges typically have more transit alternatives. 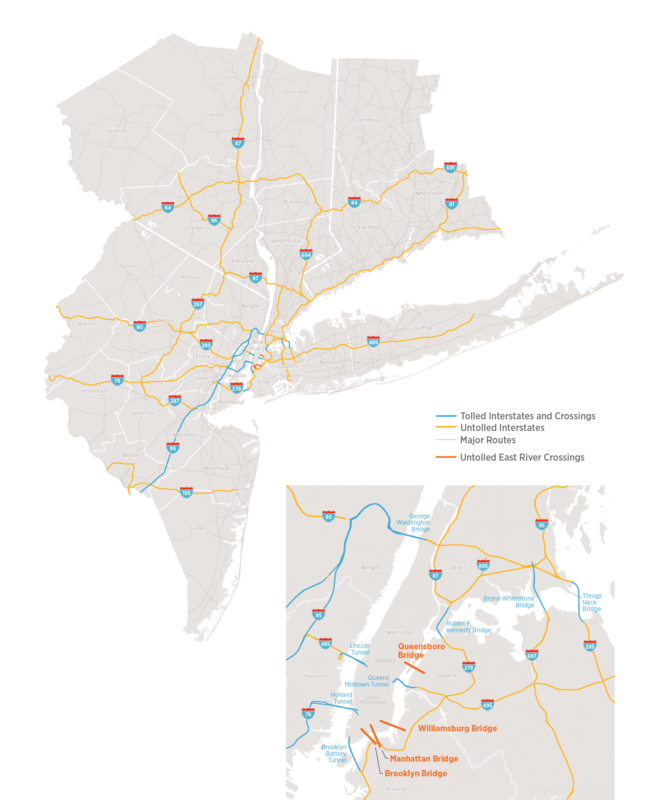 A plan by Move NY calls for combining new tolls on these four bridges and north-south avenues with toll reductions on the other crossing such that all seven East River bridges and tunnels charge the same amount. This would raise more than $1 billion annually for roads and transit, depending on the toll level set, while also reducing traffic and eliminating toll shopping. To reduce backups, tolls could be collected electronically, with the price varying by time of day to encourage fewer people to drive at peak times. Only three major highways in the region are tolled and pay for their own maintenance: the New York State Thruway, the New Jersey Turnpike, and the Garden State Parkway. These highways are largely in good condition, although rising costs and inflation have made it difficult to keep up with needs. But nearly all other major roads and highways are toll-free. A handful of tolled roads and water crossings fund the rest of the network, but revenue falls far short of need. It is unfair to toll only a handful of points in the network, because some users end up making up for the loss. One solution is to charge tolls on all major roads (including interstate-designated highways, which currently ban tolling—although exceptions can be made). This can be done with electronic toll collection technology that makes tollbooths unnecessary. For only a minimal investment, physical gantries along the 1,700 miles of major roads could be eliminated and replaced with virtual gantries using GPS waypoints. Tolls could have variable prices based on time of day or level of congestion. Trucks and other large vehicles could also be charged more because of the additional wear and tear they create on the road surface. Ultimately, the most fair way to charge people for using the road network is to base it on the actual amount of driving they do, regardless of which roads they use. Known as a Vehicle-Miles Traveled (VMT) fee or Miles-Based User Fee (MBUF), this method utilizes GPS and cellular technology, and generates enough revenue to fill the gaps in transportation budgets in all three states, as well as pay for upgrades and expansion projects outlined in the Fourth Regional Plan. These fees are also an opportunity to use infrastructure more efficiently. Fees could be adjusted to influence travel behavior, reduce unnecessary driving, and encourage other ways of getting around (like biking or taking the bus). Fees can be set higher or lower based on capacity, vehicle weight, or fuel efficiency. Adopting VMT/MBUF would require all three states to coordinate implementation, which might involve establishing a regional or mega-regional organizing body similar to the E-ZPass interagency group. Ideally, federal action would also be part of the implementation to help smooth out interstate issues and create a uniform set of standards nationwide. Although there is the potentially critical issue of the public having concerns initially about privacy due to the use of GPS and cellular technology to gather data, a transition would eventually be possible once the public was convinced appropriate measures were in place to protect privacy and delete stored records. The transition to VMT/MBUF would also be easier if the public saw the benefits of the new system, including proactive traffic management, reduced congestion, and a marked improvement in the physical condition of our transportation infrastructure. This transition would be operationally, politically, and socially sensitive, but also yield tremendous benefits to the region. Sooner or later you gotta bite the bullet and find a funding source that's fair and reasonable. And convince the citizens they're not going to waste it on something other than roads. Implementing a user-fee model would result in a sustainable and stable revenue source to fix, expand, and maintain the region’s roadways—and over time, would replace the gas tax. The adoption of variable tolling would reduce congestion and encourage modal shifts that lead to other changes, such as off-peak deliveries and car-free/-limited zones. Calculating tolls based on actual miles traveled would more accurately reflect the cost of driving and reduce VMT growth. Implementing new tolling technologies would have significant upfront costs, but revenue generated would far exceed initial investments. If 10 cents, for instance, were charged for every mile driven on the region’s highways, about $5 billion a year could be raised. Alternatively, that revenue stream could be leveraged to generate $77 billion in capital funds over 30 years. This would provide a substantial contribution to fix and upgrade our highway and transit systems, and expand transit capacity.